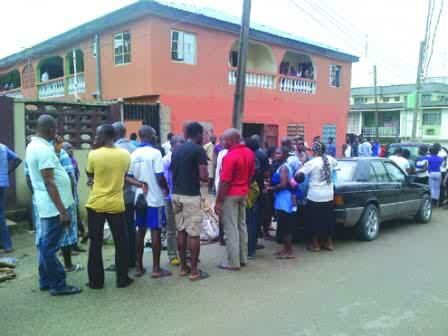 Over a hundred tenants who were expecting to be given keys to their new apartments on Monday stormed Ketu area of Lagos, southwest Nigeria, after they realised they had been duped by the property’s developer.The prospective tenants had paid hundreds of thousands of naira for 13 mini-apartments and were asked to come for their keys on Monday at the newly built house located at 59, Oriola Street, Alapere-Ketu. However, on Sunday night, rumour began to circulate that some tenants had been given keys and were already occupying all the apartments. Those who arrived today had to confront those already occupying the apartments, claiming they had also paid for the apartments. As dozens of people stormed the house in protests, the developer, the landlord and the agents had all disappeared. Their phones were all switched off. The house belongs to Alhaji Ishola Salawudeen who issued some receipts to the prospective tenants and gave his address as 59, Oriola Street, Alapere-Ketu. “I paid to the landlord himself. I came to meet him here and I paid him N230,000 for a room self-contained ,” said Iyamah Anthony Oshoke. Bashorun Ganiat who paid N475,000 for a two-bedroom flat was also stranded. Calls to the landlord did not go through. Folami Emmanuel paid N380,000 as rent for 18 months, while Mutiu Ogunlana paid N230,000. Other duped victims such as Ismail Olatunbosun, Stephen Okeleke and Abel Oke paid N325,000, N550,000 and N325,000 respectively but could not get the apartment. “I paid N205,000 for a year rent. I don’t know what to do now. I don’t know where the developer or landlord lives,” said Owoyomi Aderemi. Iyamah Anthony who paid N230,000 and Ambrose Simeon who paid N410,000 could not believe they had been duped. Utulu John Ndubusi who paid N250,000 and Ukachukwu Theresa who paid N500,000 said they don’t have anywhere else to go as they had borrowed the money to rent the house. Others such as Ebenezer Rotimu who paid N320,000, Ugochukwu who paid N150,000 and Ofenake Benjamin who paid N250,000, looked dazed and stared at the house helplessly. Pastor Yele Akin who had paid N580,000 and Omoniyi Aderemi who paid N205,000 as well as Lateef Fadipe who paid N200,000, were frantically trying to get across to the landlord or the developer. “People can be heartless,” said Alli Rasak who paid N305,000. Jessica Onuoha who paid N410,000 and Abdulsalam Olawale who paid N210,000 as well as Okechuwku Collins who paid N300,000 were about joining others to go to Alausa to lodge a complaint. Many more tenants were showing up and displaying their receipts at the time of going to press.